Leslie Saeta (Artists Helping Artists / Blog Talk Radio) nominated by Kathy Cousart. Leslie gives out daily tips on her Fb and blog along with a weekly radio show...AHA...and has written an ebook with all those tips included. Amazing artist and so giving and helpful. I thought about this one for quite some time. (The time taken to write these posts is the background research and the thinking - NOT the writing!). It struck me that there was one art blog/social media entity which has emerged as being very focused on Artists FAQs and that's the Artists Helping Artists on Blog Talk Radio which started in the summer of 2010. By which I mean that we all get to ask questions of and hear the answers from an awful lot of artists who are held in good regard online. I sat listening to the podcast by Robert Genn while writing this post. Other artists who have featured this year on AHA BlogTalkRadio are Karin Jurick, Carol Marine (and her husband David) plus people like Steve Doherty and Micah Condon. Plus Leslie and Dreama have put together a series of podcasts and posts about other aspects with which they have personal experience and there is also a supporting Artists Helping Artists art blog. I have to confess I'm not a huge fan of their sometimes lengthy preambles (maybe that's an American thing?) but overall Leslie and Dreama have filled a gap in the market and created a need we didn't know we had! I think that was the Steve Jobs approach to creating new social media products! Dreama Tolle Perry (Artists Helping Artists / Blog Talk Radio) nominated by Kathy Cousart. Kathy said Every post is thought provoking and makes you take a moment to reflect and get right with yourself. Dreama also cohosts the AHA radio show and has a wonderful book out the Artists Toolbox. Amazing! Glendon Mellow and Kalliopi Monoyios (the science-art blog Symbiartic) nominated by Emily who said These two artists/illustrators discuss topics such as intellectual property rights and illustration vs photography, they interview interesting artists, they compile and publish a list of science-art related events, they highlight science-art that's in the news, and much more. These two bloggers have their fingers on the pulse of the science-art world and their posts always make me think! An art blogger who, in the last few years, has very often made me stop and read a post again is Luann Udell (Luann Udell). Luann has learned a lot about the business of fine craft - particularly Art jewellery, small sculptures and award-winning fiber work. She nows shares what she's learned with other artists and craftspeople online - here's a link to posts categorised about business and marketing. She's been a regular contributor over time to a number of publications and websites. In addition to her own blog, she currently writes for the Fine Art Views Newsletter. I know I always look out for new posts by Luann on the business of being an artist. It could be that I favour Luann because her posts are long as mine are! I know I very much enjoy her writing. She is particularly good at conveying important messages through telling stories. She is also not averse to sharing the less positive or more emotional aspects of an artist's life - and how she goes about addressing these. I know I've changed things I've been doing as a result of reading Luann's posts. My aim is to find a book which does NOT follow the conventional publisher's recipe for a lot of art books. A "blue ribbon book"
may have been produced and marketed by the artist blogger. However published, it emphatically MUST add value as opposed to being more of the 'same old, same old'. or just nice to look at. Studio and Business Practices (published on Blurb Nov 2010) by Deborah Paris - nominated by Loriann Signori and me. First of all, I can say unequivocally that all these books fulfil my criteria. All are genuine originals and all are driven by what the artists are interested in and knowledgeable about. They share their personal experience and their knowledge of what works and doesn't work - and the difficulties faced. The first two are slim paperbacks - but are very focused on their respective topics. The third is available in alternative formats and is now available as an ebook. James Gurney's book is a hefty and heavy weight full size paperback. One book stands head and shoulders above the rest - not because the others aren't good quality because they all are. It's just head and shoulders above very many of the art instruction books ever published. It's for this reason that I'm going to break my own rules re the Making A Mark Awards as to do otherwise would be wrong. Color and Light: A Guide for the Realist Painter has been one of the most popular art books on Amazon for the back end of 2010. 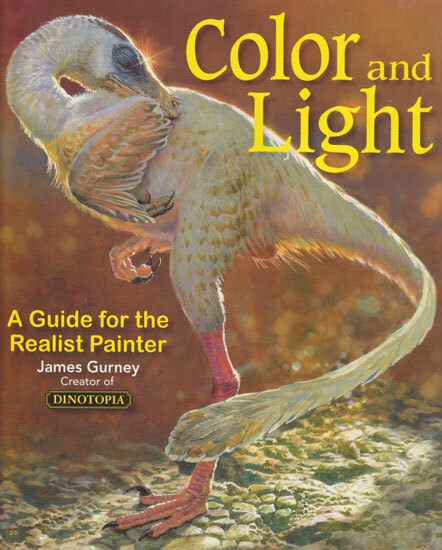 Here's the way I describe it on Makingamark's Top 10 Fine Art Books and this is my detailed review of this book Book Review: Color and Light by James Gurney. Put simply this book is a phenomenon. It has become an art book standard in the space of a year. It's going to go on selling for years to come. It's also chock full of really high quality content and for me this makes it a major contrast to so many art books which are published these days with "padding". Most importantly, a lot of the content was shared for free online in Gurney Journey as James was writing the book. James Gurney - for "Color and Light"
The next post is about the Home Front and focuses on the practical aspects of making life easier for the artist in their workplace. It should be possible for retail bookstores to special order copies in January - February - at least that is my understanding for bookstores here in the US. Again, thank you for the nomination. It is quite an honor to be included with the other wonderful authors and books. Thanks for nominating The Gyotaku Project, my little book of the good, bad and ugly adventures in printing fish. The choice of 'Color and Light' is a wise one. James Gurney's book is inspiring and informative and will be for many years to come. 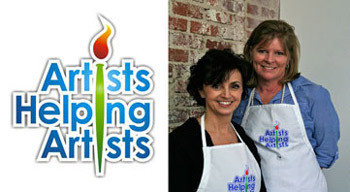 Thanks so much for recognizing "Artists Helping Artists'. Dreama and I are honored for the recognition and really enjoy producing the radio show. If you ever have ideas for the show, please let us know. You and the others will be getting your blog plaques just as soon as I'm through the rash of New Year/ beginning of the month blog posts!